THE Biggest Sewing Room in Canada! – Nice dress! Thanks, I made it!! THE Biggest Sewing Room in Canada! So what DID I do on my summer vacation? I was overjoyed to be allowed behind the locked doors of the Calgary Stampede Sewing Room! With two costume designers and over a dozen volunteer staff, the Calgary Stampede Sewing Room builds costumes and does fittings for The Young Canadians, who for over 50 years have been performing in the Grandstand Show at the Calgary Stampede every July, with additional performances throughout the year – such as their Spring Show and the Christmas Show. That means costumes for 66 performers in the Senior Company (aged 14 to 21), 48 performers in the Apprentice Company (aged 11 to 14) and 48 performers in the Junior Company (aged 7 to 11). For the Grandstand Show there could easily be 1,800 costume changes, with some changes being done in 45 seconds! Two semi trailers are loaded up with costumes, etc. and are taken over to the TransAlta Grandstand to be used as dressing rooms for the performers! It’s a rock concert quality show with over 10 miles of electrical cable, a dozen computers and 60,000 watts of power for the 17,000 seats sold and the 8,000 standees! The Young Canadians School of Performing Arts holds auditions every August and once accepted, performers receive tuition free training in musical theatre, dance, voice and other performing arts, funded by the Calgary Stampede Foundation and the Grandstand Show’s sponsor, TransAlta. Many students go on to successful careers in the performing arts. But let’s get back to the start, the Sewing Room! It is a large and cluttered space, jammed with over 80,000 costumes and 700 bins of accessories. Each year 9,000 items of clothing make up 2,500 costumes for The Young Canadians’ shows. Okay, here’s a cutesy shot at the sewing machine! Seriously now, it’s time to get to work! I feel surrounded, and I am not even in the cluttered part of the room! Getting down to business… A heavy duty Juki sewing machine. Loaner machines, for that extra help! … which is a good size. Also … everything you need is right here! hmm … something I should put on my Christmas list – a proper Steam Generator Iron! Can you imagine being watched by these critters while pressing open costume seams? Now we are looking back to the sewing/serger tables and the cutting table. Computer generated plans and patterns for future costumes on the wall. … and again MORE BINS of supplies running the length of the other wall! Anyone need any elastic? It’s a wonder there is anything left in the store!! Just a little bit of serger thread! You know I am forever forgetting to buy interfacing… wouldn’t have to worry about that here! … and yet MORE FABRIC! All bright colours, anxiously waiting to get on the stage! Now who wouldn’t want to be sprayed with “flame retardant” when fully clad in polyester? It’s not a Calgary Stampede without a few cowboy hats! … and MORE hats! … and belts galore! Need a Red Hard Hat anyone? Hangers and hangers full of different coloured bow ties. Oh look! Rows of hangers full of costumes! … all around us … more costumes! Just think – someone designed, planned, cut, sewed, serged, pressed, fitted, and performed in each and every one! I could really see this dress dancing on the stage all by itself! Hmm… this one reminds me of “Dolly”! This one kind of looks like a guy I knew a long time ago! This costume was so tiny, I wonder what age/size it was meant for? … and, of course, the Cowgirl Look… which of course needs a …. … Cow Skirt to go with it! I wonder where I could find a sewing pattern for this one? Hopefully you can tell how excited I was to see all this Imagination and Artistry. Let’s just say that I have found my “Happy Place” – “The Biggest Sewing Room in Canada” – I think I would like to retire here! Happy Sewing – especially to the designers and sewists and volunteers at the Calgary Stampede Sewing Room! Thank you, sincerely, for letting me visit! * All photos are the property of “Nice dress! Thanks, I made it! 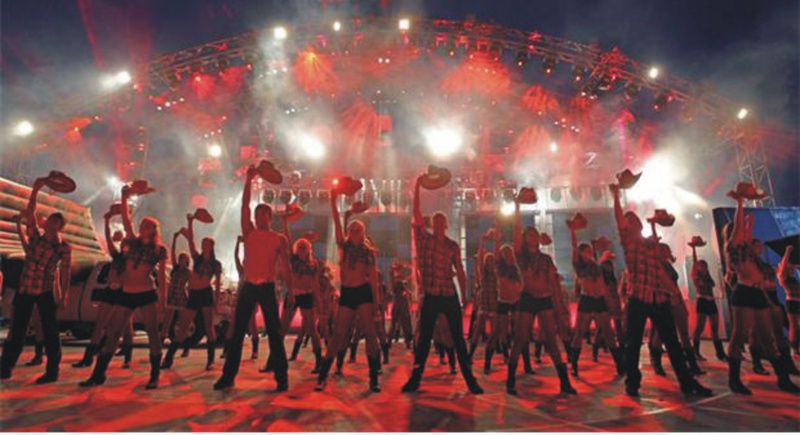 !” All Imagination and Artistry is the property of the people behind the Calgary Stampede TransAlta Grandstand Show! ** Statistics obtained from Roy Wright and The Young Canadians website. Thank you! Haha, you sound almost as excited as I was! When I am in fabric shops, I just want to touch everything! That was a bit difficult to accomplish here! I would love to be one of the seamstress volunteers, but that would mean me moving to Calgary for a couple of weeks – which is not really a drawback! It would be easy to do when I retire though – if they would take me! The Juki machines did look pretty awesome! I will have to look your’s up on their website. Thank you for reading, looking and commenting! AMAZING!! Now that’s a sewing room a person could get lost in and still be in a happy place. As I looked through the pictures, I kept saying, “look at that serger”, “look at that huge iron”, “look at all tbe dress forms”, “look at the croquis on the wall”, SOOOO COOL! What a treat. Thank you for sharing with us. I now need to re – organize my little sewing room. You are a lucky lady to have a sewing room! I am a “traveling sewist” – I wander from room to room with my little fold out sewing table (I should show it to you all sometime. It’s kind of neat! ), looking for some open space! Glad you enjoyed seeing the photos! Thanks for reading, looking and commenting! There was a time when I could sew but now I just look on with great awe. This is absolutely amazing and I can remember a time when I dreamt of being one of the many volunteers. I have seen these young artists perform, they are very talented. It was nice of you to go behind the scenes and give credit to the people behind the people. Great article. Thank you! I haven’t seen The Young Canadians perform yet, but I am planning on it, hopefully next July! I am intrigued after seeing all the bits and pieces back stage in the sewing room. Amazing what one needle and thread or the first dance step can lead to, hmmm? Holy smoke that is amazing! Looks like a fun day. Lucky you! Thanks for sharing! It was fun! Thanks for reading, looking, and commenting! Wow! That is some sewing room, you lucky girl. I love a back story so this is my kind of behind the scenes peek. Thank you so much. Haha, you’re welcome! Your dream job sounds wonderful! I guess we have to wait until retirement for our dream jobs?? In the meantime, we can try to be satisfied with our fabric, notion, and pattern stashes? Thank you for reading and commenting! Wow! that looks wonderful, all those machines, all that material, all those costumes, definitely a happy place. Oh it was so fun! Now back to the real world! Have a nice day! Thanks for reading and commenting! Wow, how did I miss this post? What an epic place!! Inspiring stuff and thank you for sharing. Oh your welcome! I was so impressed with the work done by these people, I had to share the photos!